Enucleation is an alternative procedure for treating benign and borderline neoplasms of the pancreas, which preserves healthy parenchyma and pancreatic function. This study aimed to evaluate the postoperative and long-term results after laparoscopic enucleation. 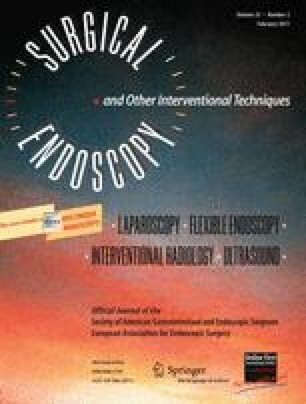 Data collected prospectively from 23 consecutive patients who underwent laparoscopic pancreatic enucleation were analyzed. Laparoscopic enucleation was achieved successfully for 21 patients (91.3%). One death (4%) occurred. A postoperative pancreatic fistula was observed in three cases (13%), and was clinically significant in one case (4%). Enucleation was performed for endocrine neoplasm in 15 patients (65%) and for cystic neoplasm in eight patients (35%). All the patients had benign tumors at the final histopathologic diagnosis. During a median follow-up period of 53 months, no patient experienced tumor recurrence or new-onset exocrine or endocrine insufficiency. Laparoscopic enucleation is a safe and effective procedure for the radical treatment of benign and borderline pancreatic tumors. The laparoscopic approach seems to be associated with a decrease in operative time, hospital stay, and pancreatic fistula after enucleation. Laparoscopy should become the standard approach in the future for enucleation of presumed benign lesions. Dedieu Arnaud, Rault Alexandre, Collet Denis, Masson Bernard, and Sa Cunha Antonio have no conflicts of interest or financial ties to disclose.